Please Note: Due to the unique headlight housings of certain vehicles, some installation may require more work than others. In certain installations, removal of the bumper and/or headlight housings may be necessary. Please refer to your service manual for details. All of our Xenon HID headlight conversion kits are plug-and-play. No wire-cutting or socket modification are required. Just follow the step-by-step instruction below. (1) Disconnect the car battery. Remove the factory light bulbs. If your vehicle's headlights have dust caps, please remove them as well. (2) If your vehicle is equipped with headlight dust caps, drill an 1" (24mm) hole to accommodate the wiring harness. (3) Remove the xenon HID bulb from the protective casing. Be careful NOT to touch the bulb. Handle it by its plastic base. If any grease or dirt gets on the bulb wipe clean with rubbing alcohol. (4) Put the bulb's wiring harness through the dust cap (as illustrated). Insert the xenon HID bulb into your headlight and secure. Connect the spade terminals (positive & negative) to the factory headlight wiring harness. (5) Insert the rubber boot (on the wiring harness) through the hole on the dust cap (which you drilled earlier). 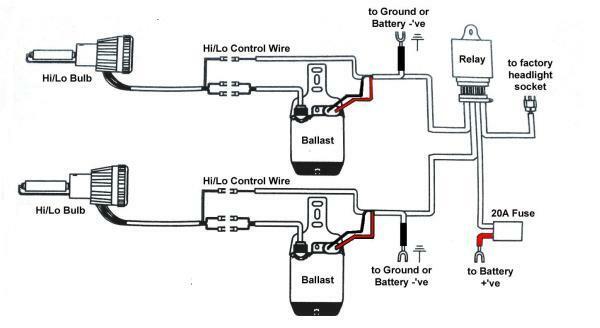 (6) Connect the bulb to the ballast. The quick dis-connects will "click" once fully secured. (7) Find a mounting location for the ballast. Use the ballast bracket, screws or zip-ties as needed. *Do not drill holes on the ballast box. *Mount away from moving components. *Mount to a secure location. (8) Check your vehicle's headlight fuse. Make sure it is rated at 20AMPS or higher. Replace the fuse with a 20 AMP fuse if your headlight fuse is of a lower rating. (9) Reconnect the battery cables. (10) Turn light switch on and allow your new xenon light to run for 10 minutes. Enjoy your new xenon headlights!